His Eminence the Most Reverend Meliton (Karas), Metropolitan of Philadelphia (elected 1990), is a Metropolitan of the Ecumenical Patriarchate and serves as the Coordinator of the Secretariats of the Patriarchate. He is also a member of the Holy Synod and the godson of Ecumenical Patriarch Bartholomew I.
Metr. Meliton was born in Imvros (Gokceada), Turkey, on March 14, 1951. He holds a B.A. (1974) and a Ph.D. (1986) in Theology from the Theological School of Thessaloniki. He was ordained as deacon in 1974 by his Elder, Meliton, Metropolitan of Chalcedon, receiving the name Meliton, and immediately was appointed Codicographer of the Holy and Sacred Synod. He served as Under-Secretary of the Holy Synod of the Ecumenical Patriarchate from 1984 and as Chief Secretary from 1987 till 2005 when he resigned to accept appointment as the Coordinator of all the Secretariats of the Patriarchate. He received post graduate education in France and England and participated in Patriarchal representation and delegations in Inter-Orthodox and Inter-Church Conferences. 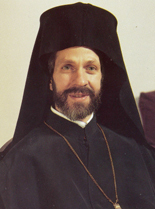 From 1987 to 1990, he accompanied Ecumenical Patriarch Demetrius on his official visits to other Orthodox churches. This page was last edited on March 17, 2012, at 01:44. This page has been accessed 16,714 times.